Sample letter to rejoin the job after resignation or long vocations due to emergency without notifying the employer, company, office, manager. 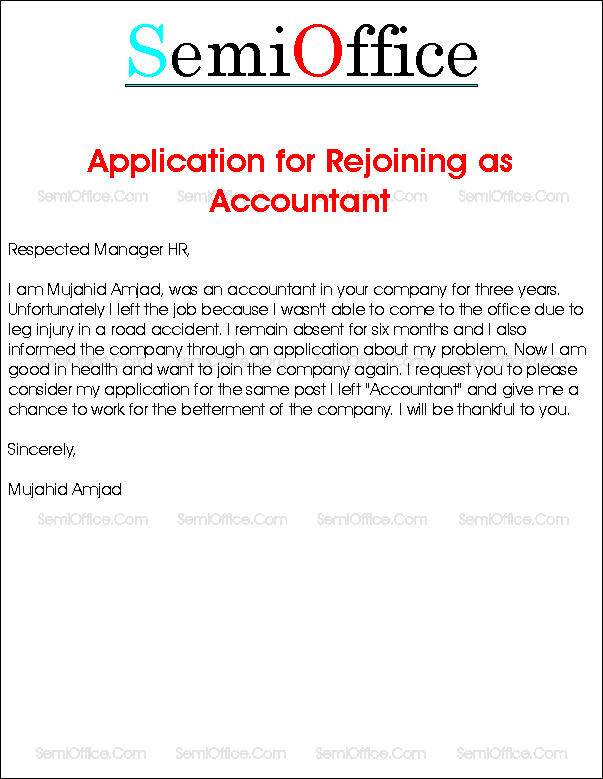 This job rejoining/rehire or rehiring letter sample can be used for any post of management, drivers, cashiers, administrator etc. Rejoining letter after absents/absence from office, factory, business, mill, hospital etc. It is requested that Mr. Muhammad Sarfraz S/O Taj Muhammad has been working as Electrician + Driver with Natlass Afghanistan since 3 years. I have come back to my home on 17-05-12 for a few days on Personal Leave but I received calls from the Natlass Company that I only return back after receiving any further call of rejoining. I am waiting for the call since last three months and yet there is no such call of rejoining I received. I request you to please consider my request for rejoining even in new terms of the low salary. My leaves can be considered with no salary. I am much needy and deserving person having no other income sources to take care of my family(including wife and children). I request you to please give me the opportunity to rejoin the Natlass Afghanistan Company and I will be thankful to you. I am available to rejoin at any time and day. With all due respect I would like to bring it to your knowledge that I have submitted a leave application 3 months ago as I was suffering from kidney disease, I was diagnosed with stones in my kidney, as advised by the doctor I was supposed to start my medication and to have a complete bed rest for 3 months. I had undergone a surgery and I am perfectly fine now. I understand that work must go on and I appreciate your cooperation with me in this time of need. I would like to inform you that I am fine now and can join duty right after approval from the company. I am looking forward for a quick response as a have to continue the work. Your corporation will be highly appreciated. Thanks. I am Ms. Minahil Qasim. I have worked for four years with your company and performed very well during my job tenure. Four months back I resigned from the job due to domestic and medical issues. Now all is good, I am medically fit and domestic issues have be resolved. From a reliable source I came to know that the post I left is still vacant. I request you to please allow me to rejoin the job for the same post and monthly salary. Now after some relaxation I believe that my performance would be more efficient. I will be great full to you. 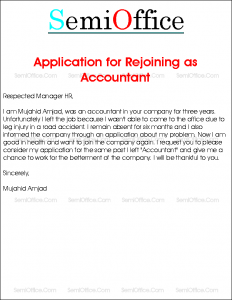 Sample application letter for rejoining the company as accountant, manager accounts, accounts officer, finance manager, finance officer, audit officer after a long vocation and leg injury. I am Mujahid Amjad, was an accountant in your company for three years. Unfortunately I left the job because I wasn’t able to come to the office due to leg injury in a road accident. I remain absent for six months and I also informed the company through an application about my problem. Now I am good in health and want to join the company again. I request you to please consider my application for the same post I left “Accountant” and give me a chance to work for the betterment of the company. I will be thankful to you. I am writing to you because I would like to rejoin the health care company. Three months I was forced to leave my job in your company as I had a liver infection and I was very bad. The doctor told me that I would have enough time to wait for the process of leave or holiday application and so I left. The infection was very bad and I had to wait for a liver transplant. I would like to have my job back because I love working with this company and I enjoy the work that I did. Helping people and getting them better. I am a very hard worker and I am motivated and determined to succeed. I hope that you will give me my job back and I look forward to hearing back your response. Pls help. I need a rejoining letter to previous employer after signing off my contract. Before signed off they offer me to continue to work with them and join their new company. Because I’m worried what happend if I will not got employed with them. So I refused the offer, now I decide to work with my same employer. Thanks..